” NIGHT OF BROADWAY” hit the stage on February 16 and 17, 2019!! We also had the Silent Auction with the Saturday night show, with the concert only on Sunday afternoon. 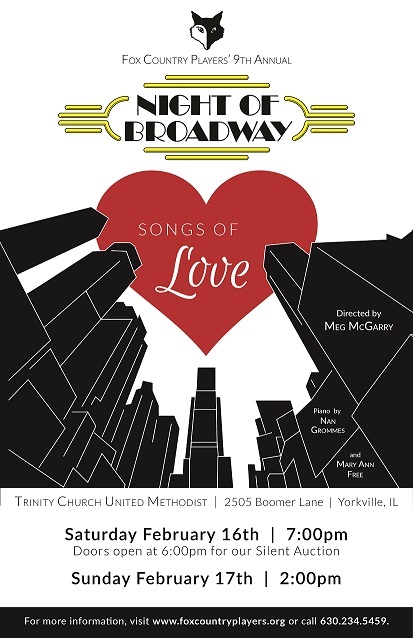 Because of the show’s proximity to Valentine’s Day, this year’s fantastic musical showcase featured songs about love, in all its forms. This show was again be directed by Meg McGarry, with piano accompaniment by Nan Grommes and Mary Ann Free. We also added Brian Knechtges on guitars and banjo and Elias Martinez on percussion. The auction fund raiser for our Theatre Arts Academy was an amazing success. We took in slightly more than $3,000!! Thank you so much to all who donated and bid on the wonderful selection of items collected by Allison Scigalski.